On the 10th or 11th of August 991, English forces were defeated by a Viking army at Maldon. Byrhtnoth, ealdorman of Essex, was killed in the fighting. Seemingly soon afterwards, whilst the memory was fresh, the event was commemorated in a vernacular poem, known today as ‘The Battle of Maldon’. It survived into (relatively) modern times in a single, incomplete, copy – both its beginning and end were missing. This copy found its way into the manuscript collection of Sir Robert Bruce Cotton (1571–1631). The poem, as it now exists, begins with Byrhtnoth deploying his troops for battle. He orders them to dismount and chase their horses clear of the site. He rides amongst them, giving instruction and encouragement, before himself dismounting amongst his most loyal retainers. pay heed to hands and high courage. 10 would not weaken at battle, when he took up weapons. when he had to fight before his lord. firm in their fists, and never be afraid. where he knew his retinue most loyal and brave. Byrhtnoth's men are facing a Viking army across a tidal river – the Pante (now the Blackwater). A Viking spokesman (none of the Vikings are named) calls across the water. He demands tribute, saying it would be in Byrhtnoth's interests to buy peace, rather than to engage in battle. Byrhtnoth replies that he will not give up without a fight, and orders his men to form a shield-wall along the river-bank. At length, the tide recedes, exposing a narrow causeway. than for us to share such a hard battle. 35 we'll call a truce in exchange for gold. 45 “Do you hear, seafarer, what this people says? the heriot that will not help you in battle. this far into our country. until they all stood on the river's edge. until they could bring their spears together. unless one might fall from an arrow's flight. a great many Vikings eager for battle. The favourite suggested site for this encounter is the causeway which, at low tide, still connects Northey Island to mainland Essex about 1½ miles south-east of Maldon town centre. 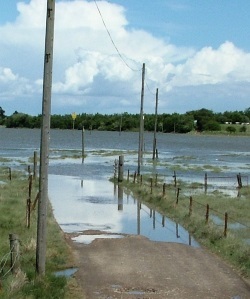 Pictured right is the present-day causeway to Northey being inundated by the incoming tide (May 2015). A geological investigation carried out in 1973, by G.R. & S. Petty, showed that the channel at high tide in 991 was about 120 yards wide – about half the width that it is today. Three brave Englishmen fiercely defend the crossing-place, keeping the Viking host pinned-down on the other side of the channel. The Vikings decide on a change of tactic, and, playing on Byrhtnoth's pride, goad him into letting them cross. In 2006 the statue of Byrhtnoth pictured above, by John Doubleday, was erected at the end of the Promenade in Maldon, looking toward Northey island. who stepped most boldly across the bridge. as long as they might wield weapons. to lead their footsoldiers across the ford. 90 to allow too much land to that hateful people. the seamen bore their linden shields to land. 105 when fated men should fall. It may seem like an act of total folly, to have let the Vikings cross the causeway – the poet's tone certainly seems to be critical. On the other hand (assuming that the poem really is a true reflection of what happened), if Byrhtnoth had simply maintained his position, the Vikings might well have put to sea, to land elsewhere. Byrhtnoth may have believed that bringing them to battle at this time was his best chance of victory. Battle is joined. Byrhtnoth is wounded by a spear, but carries on fighting. He is struck by another spear, and still carries on. His sword-arm is then wounded, so he can no longer fight, but he still spurs his men forward. He is now so weak he can barely stand, and he is hacked to death. the eagle longed for prey, and panic was on earth. 110 the bows were busy, the shield-boards took the arrows. warriors fell, young men lay dead. 115 to pieces with swords, his sister's son. to his chamberlain when he had the chance. soldiers with weapons; slaughter fell on earth. if he hoped to earn fame from the Danes in the fight. his shield for protection, and stepped toward him [Byrhtnoth]. each of them thought to harm the other. and sprung out the spear when the point sprang back. the proud Viking who gave him that wound. and he took the life of his attacker. for the day's work the Lord had allowed him. through the noble thegn of Æthelred [i.e. Byrhtnoth]. the one who had grievously wounded his lord. his robes and rings and decorated sword. from its sheath, and swung at his mail-coat. 165 with a wound in the earl's arm. 170 and bade them go forth as good companions. for all the joys I have had in this world. and gave up their lives with their lord. A late-12th century history of the monastery of Ely (of which Byrhtnoth was a patron), the ‘Liber Eliensis’, also has an account of the battle, or, according to this somewhat garbled version of events (II, 62), the two battles, of Maldon. In the first battle, Byrhtnoth is victorious – killing most of the Danes on a pontem aque, literally ‘bridge of water’, which must surely be the causeway. Four years later, Danes, led by Justin and Guthmund – the names given to the Danes' leaders at the battle of Maldon by Florence of Worcester – return to Maldon to exact revenge for their comrades' deaths. They send messengers to Byrhtnoth, daring him to meet them in battle. Byrhtnoth, “with a few warriors”, marches to confront them (whereas Henry of Huntingdon says that Byrhtnoth “met them in great strength”). Despite being outnumbered, he and his men fight fiercely for fourteen days – killing large numbers of the enemy and almost succeeding in driving them off. On the last day, by which time Byrhtnoth had only a small number of men left alive, the Danes: “made a wedge-formation and, grouping together, rushed with one resolve upon him and, with a great effort, only just successful, cut off his head as he fought. They took it with them, fleeing from the place to their native land.” Byrhtnoth's widow is said (II, 63) to have gifted “a hanging woven upon and embroidered with the deeds of her husband” to Ely. Presumably this hanging was similar in style to the Bayeux Tapestry, and some of the detail in the Byrhtnoth/Maldon story, as told by the ‘Liber Eliensis’, may have been derived from a flawed interpretation of the images embroidered in the hanging. The cowardly Godric flees from the battle on Byrhtnoth's horse. Many others, thinking that it is Byrhtnoth who is fleeing, themselves run away. The poem, as it now exists, closes with Byrhtnoth's faithful followers fighting to the bitter end. he had given them for their services. who later would not stand firm at need. saw that their lord lay dead. to give up their lives or avenge their dear lord. 215 now he who is bold has to prove it. a wise nobleman, and prosperous in the world. friends and companions, to go forth. wretched son of Odda, has betrayed us all. avenge in the battle my beloved lord. fought tenaciously; he scorned flight. and bring about the downfall of their foe. the son of Ecglaf – his name was Æscferth. as long as he was able to wield weapons. or turn back now that his better lay dead. his treasure-giver, then took his place among the slain. and there Gadd's kinsman [i.e. Offa] sought the ground. he lay like a thegn at his lord's side. 300 before Wigelin's son [i.e. Wistan] lay down in the slaughter. weary with wounds. Slaughter fell on earth. use their weapons without weakness. courage the greater, as our strength grows less. who thinks to turn back from this war-play now. hacked and laid low, until he fell on the field. According to the ‘Liber Eliensis’ (II, 62), the abbot of Ely, and a party of monks, recovered Byrhtnoth's body: “He brought it back to the church and buried it with honour. And in place of the head he put a round lump of wax.” The compiler says that, “long afterwards” – probably in 1154, when Byrhtnoth's remains, along with those of another six of the abbey's major, pre-Conquest, benefactors, were moved into the Norman Ely Cathedral – the body: “was recognized by this sign”. To cut a long story short, the compartment containing Byrhtnoth's bones was opened on 18th May 1769, by one James Bentham. Bentham was familiar with “the account given by the author of the ‘Liber Eliensis’, of the unfortunate battle of Maldon”, and in a letter read to the Society of Antiquaries on 6th February 1772, he reports that, as he expected: “there were no remains of the head, though we searched diligently, and found most, if not all his other bones almost entire, and those remarkable for their length, and proportionally strong ... it was estimated by Dr Hunter that the Duke [i.e. Byrhtnoth] must have been 6 foot 9 inches in stature. It was observed that the collar bone had been nearly cut through, as by a battle-axe or two-handed sword.” It is a curious fact that the ‘Liber Eliensis’ says that Byrhtnoth was the ealdorman of Northumbria (Latin Northanimbrorum dux – hence Bentham calls him “Duke of Northumberland”), and has him travel to and fro between Northumbria and Maldon to fight the two battles. This might not be quite as absurd as it sounds. According to ‘The Battle of Maldon’ poem (lines 265–272), in Byrhtnoth's entourage was a hostage “from a strong family of Northumbrians” (he gives a good account of himself against the Vikings, fighting to the death). Byrhtnoth was a senior ealdorman,* and he may have been sent by King Æthelred to sort out some problem in the North, that required the taking of a hostage to ensure the “strong family of the Northumbrians” toed the line, shortly before his last-stand at Maldon – this being later misunderstood, and it supposed that Byrhtnoth's home territory was Northumbria. 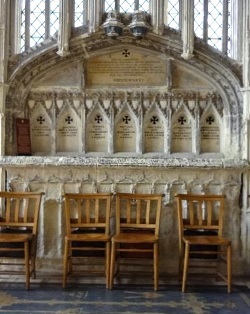 Subsequent to James Bentham's investigations, the seven benefactors were moved to their present position in Ely Cathedral. Byrhtnoth's niche is furthest right. This page was last modified on 28th February 2017. In fact, Thomas Hearne attributed the transcript to John Elphinstone, David Casley's predecessor, but it is now believed that it was actually Casley's work (H.L. Rogers ‘The Battle of Maldon: David Casley's Transcript’, in ‘Notes & Queries’ new series 32, 1985). Byrhtnoth was married to a daughter of Ælfgar, who was probably a previous ealdorman of Essex, and who, charters indicate, died in 951. Byrhtnoth had married Ælfgar's daughter by the time the latter made his will (S1483) – which can be dated between 946 and 951. Byrhtnoth himself features as an ealdorman in charters from 956. Byrhtferth places the battle of Maldon – which he does not in fact name; saying that a “savage battle was fought in the east of this great country” – before the death, in 988, of Dunstan, archbishop of Canterbury, seemingly in order to juxtapose it with his notice (V, 4) of an earlier battle against Vikings (“the accursed Danes”), that he begins: “A savage battle took place in the west”. OE cellod. This adjective is only found here – its true meaning is not actually known. The terms ‘treasure-giver’ (OE sincgyfa) and ‘ring-giver’ (OE beahgifa) have the meaning ‘lord’ or ‘king’ (such metaphorical compound words are called ‘kennings’), in this case referring to Byrhtnoth of course. In fact the text says “the seafarer”. It is possible that a couple of previous lines, setting-up this particular Viking, are missing. OE burh – from which the modern word ‘borough’ – a fortified site. This could be a town, meaning Maldon, but in this instance Byrhtnoth's base is probably meant. That is to say: ‘treasure in exchange for peace’. OE (Old English) heregeatu – means ‘war-gear’ (i.e. weapons and armour), but it is also a type of tax (tribute payable to the lord on the death of a tenant), so it is doubly ironic. OE æschere, literally ‘ash-army’. Although Viking ships were predominantly built of oak, it seems that, for some reason, the word ‘ash’ was descriptive of a Viking ship. In 896 (though appearing s.a. 897 in the ‘Anglo-Saxon Chronicle’), Alfred the Great had ordered ships of a new design to be built: “they were full nigh twice as long as the others; some had 60 oars, some more; they were both swifter and steadier, and also higher than the others; they were shapen neither as the Frisian nor as the Danish, but as it seemed to himself that they might be most useful.” Alfred had ordered these new vessels specifically: “to oppose the æscas [i.e. the Viking ships]” that were plaguing the south coast of Wessex at the time. OE ofermod. ‘Overconfidence’ is perhaps a rather mild interpretation – elsewhere it has the meaning ‘pernicious pride’. In the king's charters, an ealdorman's seniority is indicated by his position in the witness-list. Byrhtnoth became an ealdorman in 956 – bringing up the rear of the ealdormen in the charters he witnesses. From 984 onwards he is consistently in 2nd position, behind Æthelwine, ealdorman of East Anglia. Æthelwine died on 24th April 992, and he had evidently suffered from a protracted and painful illness,* so it may be that Byrhtnoth was, effectively, the most senior ealdorman in England at the time of the battle of Maldon. Æthelwine became an ealdorman in 962. Ramsey Abbey was founded c.966 by Æthelwine and St Oswald. Byrhtferth of Ramsey, in his ‘Life’ of St Oswald says (V, 15) that Æthelwine: “had been afflicted by a lengthy illness, such that he could scarcely eat because of the pain.” Æthelwine, who died just a couple of months after Oswald, was buried at Ramsey (Oswald was buried at Worcester). St Oswald (d.992) became bishop of Worcester in 961 and archbishop of York in 971. When he became archbishop of York, however, he also retained the bishopric of Worcester. Byrhtferth was a monk at Ramsey Abbey (north of Huntingdon), which was founded c.966, by Oswald and Æthelwine, ealdorman of East Anglia. Henry, archdeacon of Huntingdon, first produced his ‘Historia Anglorum’ (History of the English) about 1130. He later revisited the work – revising and extending – several times. The final version concludes with the accession of Henry II in 1154.